Nex Flow™ has four (4) versions to address virtually any application where they may be applied. The Nex Flow™ Air Amplifiers take compressed air and entrain surrounding air to amplify Air Flow downstream. Often called “Air Movers” they move a tremendous amount of air utilizing the “coanda” effect. The downstream air produced has high velocity and “laminar flow” for strong blow-off an cleaning power. Ari amplifiers are quite, by moving parts, compact, portable, and low in cost. Heavy Duty Standard “Fixed Gap” Air Amplifiers are protective coated, cast zinc and aluminum units which are rugged for factory environments. Stainless Steel shims fix the “air gap” and additional shims may be added for increased output. Units are designed to mount easily onto equipment with built in mounting holes. Adjustable Anodized Aluminum Air Amplifiers are made of anodized aluminum for environmental protection. Units are low in cost and the “air gap” can be adjusted to a setting desired for a particular application, and locked into place using a lock ring. Popular for machine builders due to low cost and light weight. Adjustable Anodized Aluminum Air Amplifiers Gauged for Accurate Gap Setting is the same as the regular adjustable units except they are marked to accurately set the air gap. 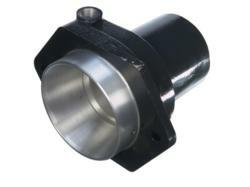 Ideal for precision applications on equipment. Stainless Steel Adjustable Air Amplifiers are the stainless steel versions of the adjustable units for high temperature and food applications. Applications include: remove water, coolant, dust and scrap in parts manufacturing/assembly operations, cool enamel and water based paints in parts manufacturing, auto body shops or assembly lines, blow off of water from the tops of cans, bottles and all types of packaging prior to labeling, ink jetting, palletizing or packaging, convey light materials and waste, part ejection, fume removal, dust and liquid blow off from all types of parts, replace fans for better and faster cooling in many applications, cool, clean and dry all types of material before painting, coating or polishing, remove coolant mist form machining operations and to boost existing fume removal systems. cool Steel Forgings, and trim removal in paper, film or foil operations. Stainless units have been used on ovens to isothermalize and in blow molding operations for cooling.